This is the archived press release page, for items more than six months old. To see news Fflashes and updatements to my site, go to the What's New? page. 18th April 2016 More Events listed on appearances page. 18th April 2016 New Toad News Story, this one about Guinea-pigs . 14th February 2016 Melbourne event listed on appearance page. 28th January 2016 Canberra event added to appearances page. 18th January 2016 Finncon added to appearances page. 15th January 2016 Updated appearance page, all 2016 events listed. 5th January 2016 Altered twelve pages so there can be no confusion that the Thursday Next car in the books is a Porsche 356 Speedster, but that the one depicted scattered variously about the website is of my replica Speedster, which (a Porsche owner) recently pointed out is emphatically NOT a Porsche. The nearest closest driving relative to my Speedster is probably a Trabant. I argue that having Speedster replicas is vital as it gives visibility to a marque that is quite possibly the most lovely car ever designed. 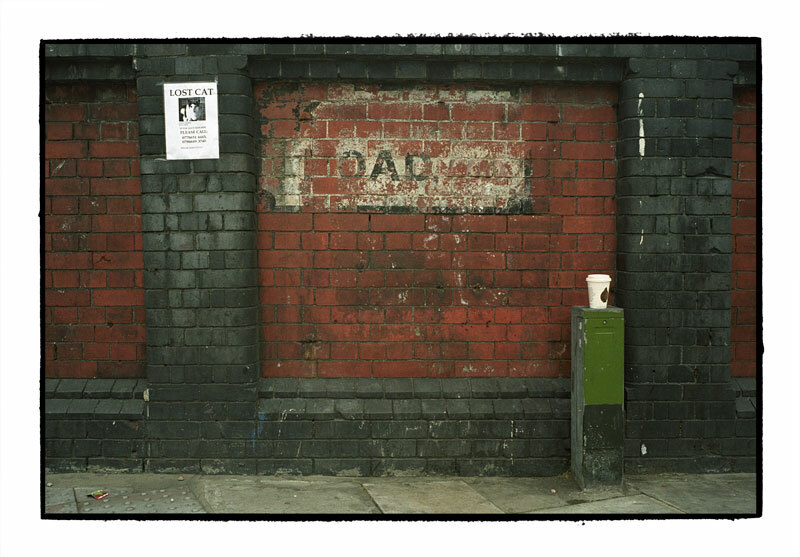 28th May 2012 UK tour details up! 28th May 2012 Your wild librarian stories..
23rd May 2012 Facebook page linked to Twitter page and banner changed above. 14th May 2012 CONfusion festival cancelled at Keele for the 15th June. If you thought the answer was 'paper' or 'a computer' you would only be half right. From 2002 until 2011 I wrote all my books on this desk. So that would include: Lost in a Good Book, The Well of Lost Plots, Something Rotten, First Among Sequels, Shades of Grey and Song of the Quarkbeast. Rewritten on this desk were The Big Over Easy, The Fourth Bear, and The Last Dragonslayer. It has endured three house moves, too. Only The Eyre Affair and The Woman Who Died a Lot were written elsewhere. The reason I am explaining this is because the desk is now retired and will be auctioned off at the 2012 Fforde Ffiesta in order to assist the Fforganisers in meeting the (constantly increasing) costs of putting on the Ffiesta. 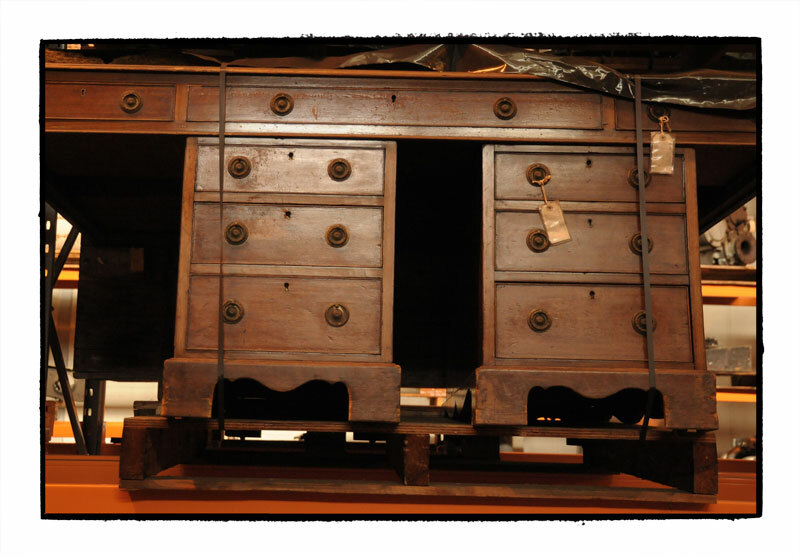 There will be no reserve to the auction, and the desk will be signed on the underneath by me, outlining what it was, and its utter lack of global significance. Don't contact me about it. Direct any queries towards: The Ffiesta Website. 5th March 2012 Finally! Thursday Nextreme Competition Winner announced. Yes, two years late, but we lost the trophy. 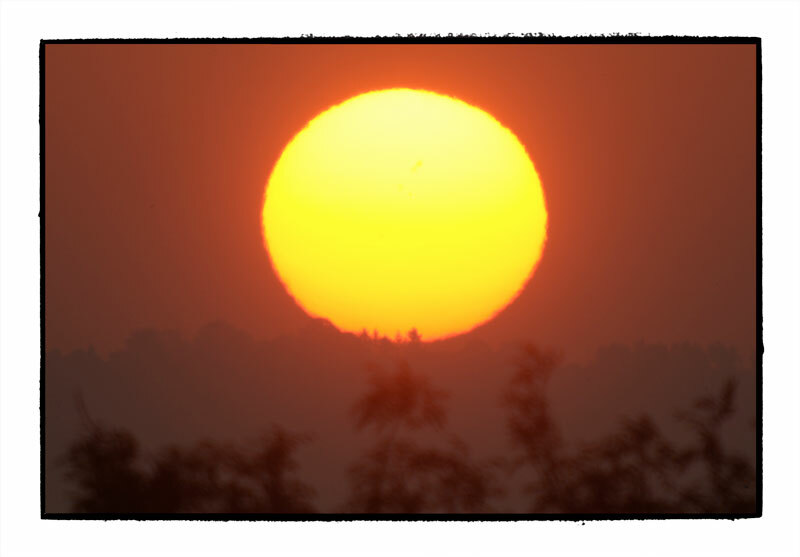 2nd March 2012 Sneak preview of next TN book now posted! 1st March 2012 Lots more events posted up - US and UK Tour dates! +++ Title change for the upcoming Thursday Next book. No longer Dark Reading Matter but the more descriptive (and fun) The Woman Who Died a Lot. Dark Reading Matter will now be the title of TN8. A hasty mock up so we can have something to look at. The actual covers will be a lot better. 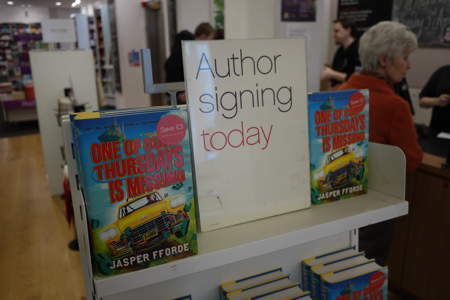 30th Jan 2012 USA One of Thursdays is Missing published today - COMPETITION! 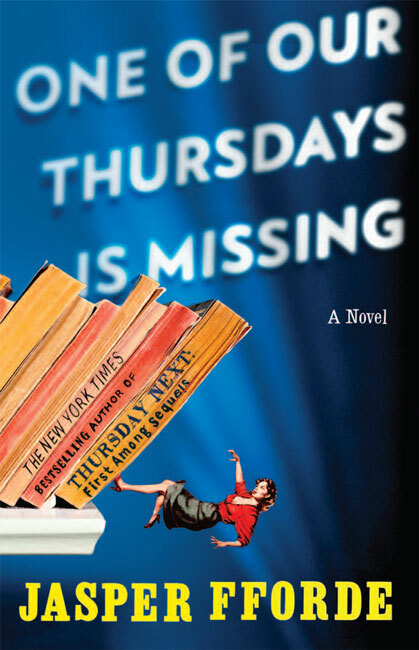 The paperback edition of One of our Thursdays is Missing. Alternatively, they are also available in your local independent. 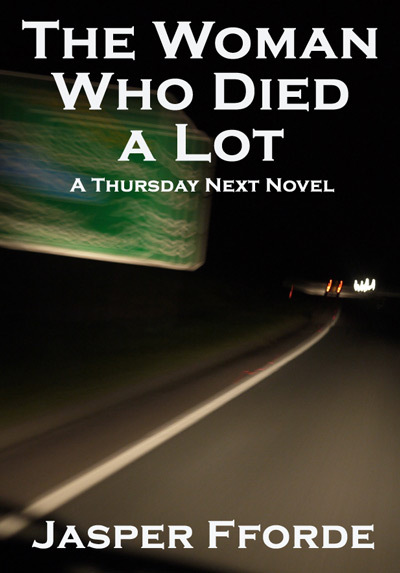 There is a competition to win some books..
A preview of the DTV edition of TN6 'Wo Ist Thursday Next' slated for publication in August, 2012. For more details, go to the DTV Catalogue. 22nd Jan 2012 Toad News: Quality Street downgraded by Trading Standards Authority. 15th Jan 2012 Toad News: Cars flattened. Police seek 32 ton hedgehog 'with grudge'. 13th Jan 2012 All ten books given away in my TN book balancing competition. 12th Jan 2012 Competition: More entries. One more to go in book balancing competition..
10th Jan 2012 Competition: Three entries already! Who needs Twitter? 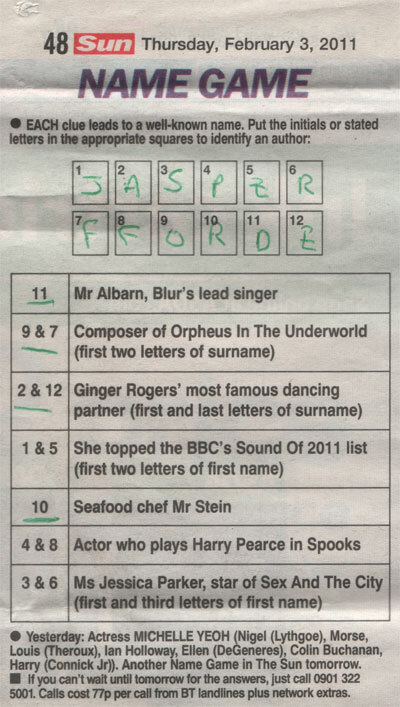 8th Jan 2012 Toad News: Jeremy Paxman to interview reclusive buccaneer. 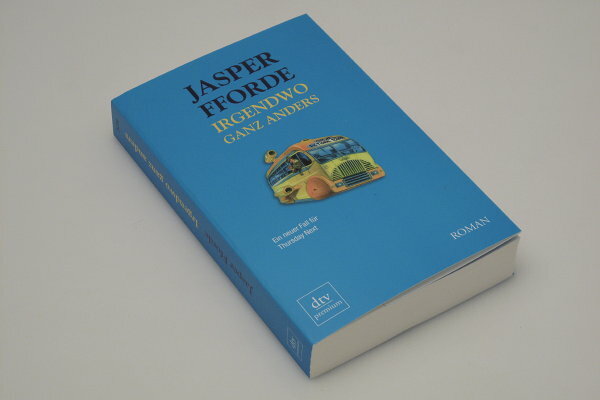 5th Jan 2012 Used Furniture Review interviews Jasper Fforde. 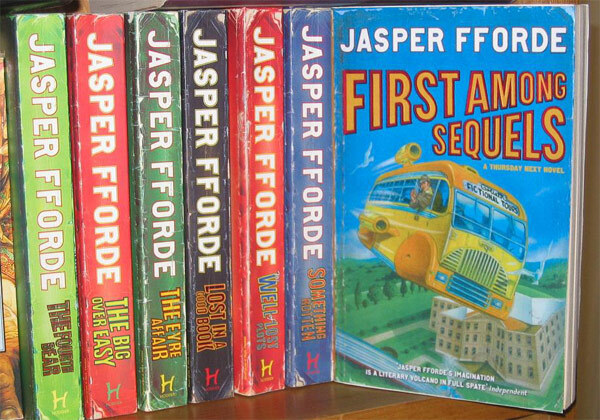 5th Jan 2012 Jasper now loading pictures on to INSTAGRAM, if you are so equipped - under the username 'jasperfforde'. 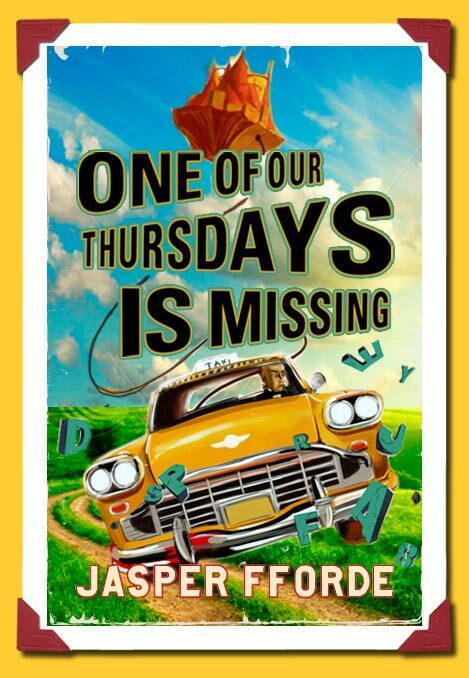 One of our Thursdays is Missing is now available as a UK paperback. 2nd Jan 2012 Toad News: Dog Archbishop calls for owners to 'not give up' on puppies. 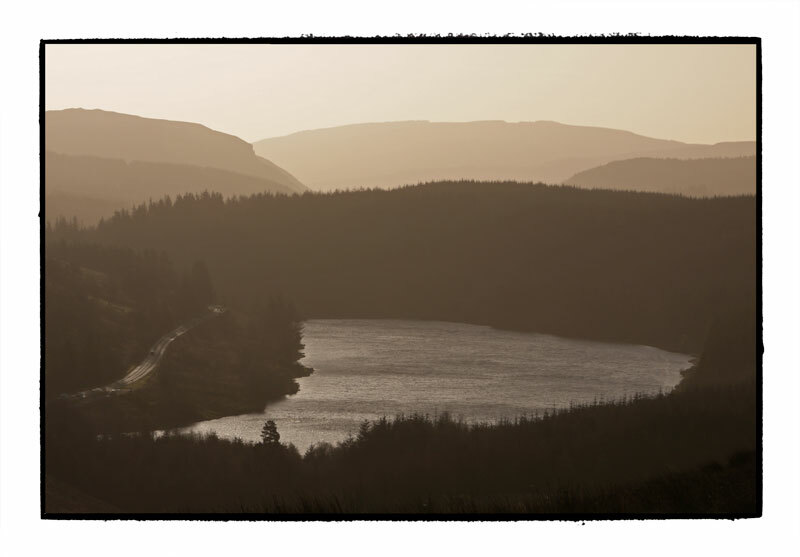 The Llywyn-On Reservoir, taken from the road to Neath, S Wales, early morning. For more POTW, go to Picture of the Week Index. On the Wye Valley Walk, just above Monnington, Herefordshire, UK. "Shades of Grey" (Grau) wins Bronze in the German Reader's Choice Award!! 35 titles made it to the shortlist of each category and Grau reached the Top 3! You can find who else won prizes at the List of Winners. This was on a commercial for Paul Arden that we shot in 1999, so although I took the snap, I cannot claim to be the author. 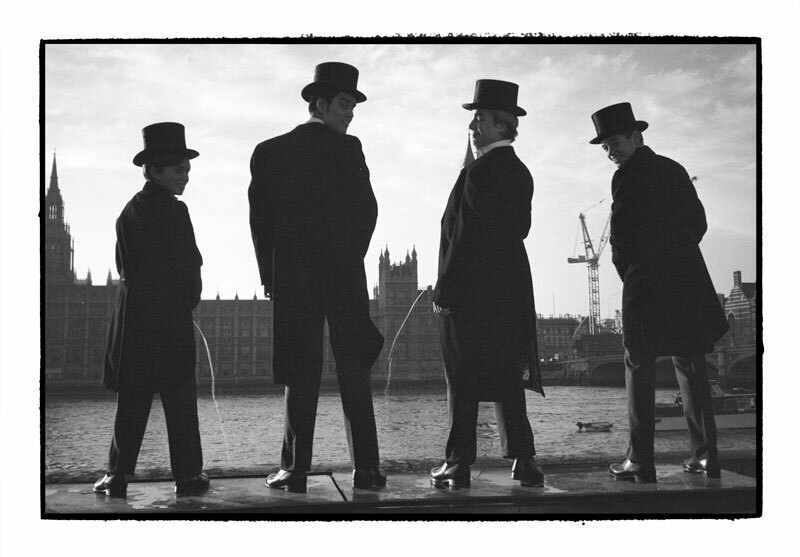 The picture seems particular apt now that Etonians are back in power. The boys were actually using squeezy bottles for the wee effect, and at one point a policewoman marched up about to arrest us all, but then she saw it wasn't wee and we could, in fact, film quite legally here, she moved off, with a polite apology. Wouldn't happen now. This would be considered a 'demonstration' within a mile of parliament square and we'd all be down the nick. It wouldn't have stopped Paul Arden though. He'd still have filmed it. Marvellous character, sadly no longer with us. For the life of me, I can't remember what the commercial was for. Not for Eton, obviously. 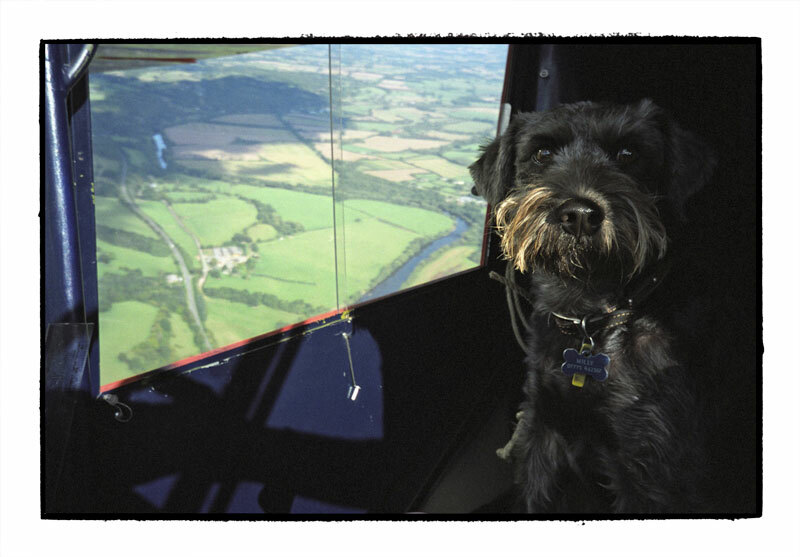 Milly was a terrific dog - sadly no longer with us - and went everywhere with me, including flying. She used to look out of the window for a bit, yawn, then curl up for a nap. She was a fair co-pilot (I've had worse) but could never get the hang of banking in an aircraft. As any aviator will tell you, a banked turn in an aircraft is a balanced turn - the line of gravity remains vertically below the aircraft, irrespective of where the planet might be. If you've ever had a drink in your hand in a Jetliner which is banking, the liquid in the glass stays, yes, level to the aircraft. You can do a balanced turn and roll completely over and back to upright, still with the line of gravity pointing through the floor of the aircraft. In any event, Milly didn't really get the whole 'messing around with gravity thing', and when I banked left, she'd take a visual cue from the horizon, lean right to compensate, and fall over. This was probably why she simply yawned and went to sleep. This was taken about 2000' above Bronydd - that's a bend in the river Wye beyond, and Cabalva Farm. "Der Leserpreis - die besten Buecher 2011" is a big success in this year again. It is one of the biggest audience bookawards in the German-speaking area. Until yesterday readers could nominate their favourite books for the Leserpreis 2011. Now the important phase starts. Here readers can vote for their favourite books until 27 November 2011. On Monday 28th November 2011 the Leserpreis in Gold, Silver and Bronze will be awarded. If you like to call your reader's attention to your nomination and the voting, please link to this website. 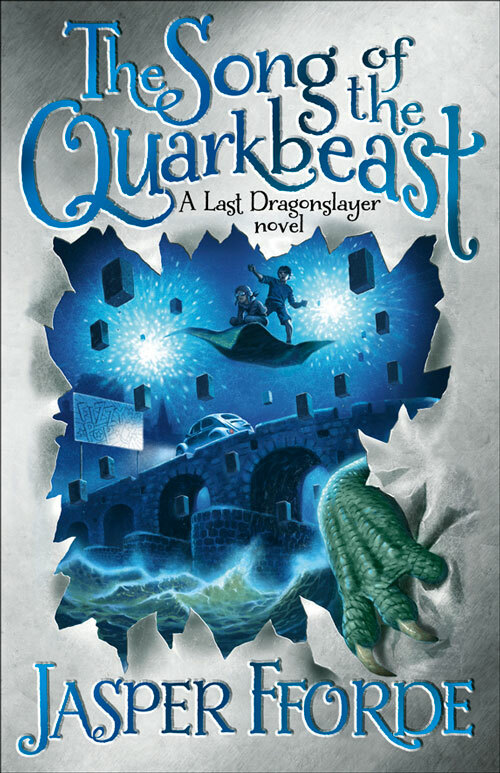 Published today, November 10th 2011, The Song of the Quarkbeast. For more details, have a look HERE. If you want to order, try your local bookshop or Amazon or Waterstones. and on this occasion, got thrashed. 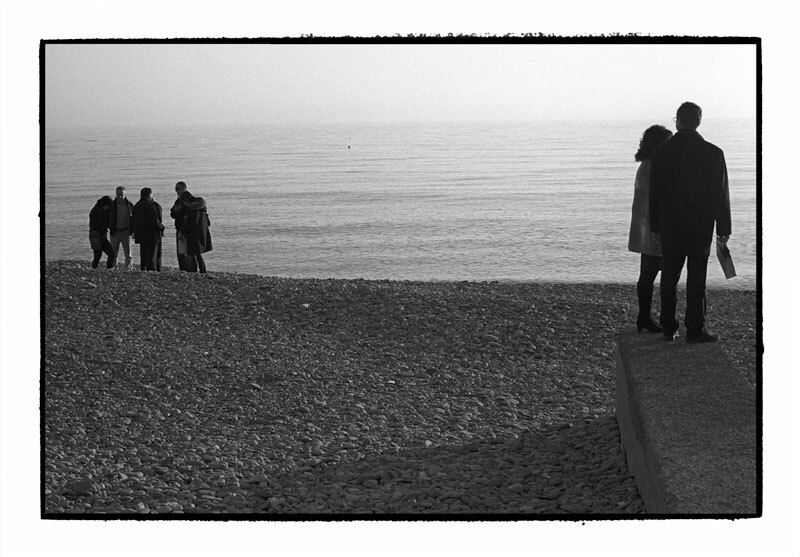 My entry to the 'Grand Fromage de Photographie' competition at Cannes, 2007. 13th Oct 2011 First winner in Canadian Giveaway Competition - hurry hurry with your entries..
++ News on the latest book. 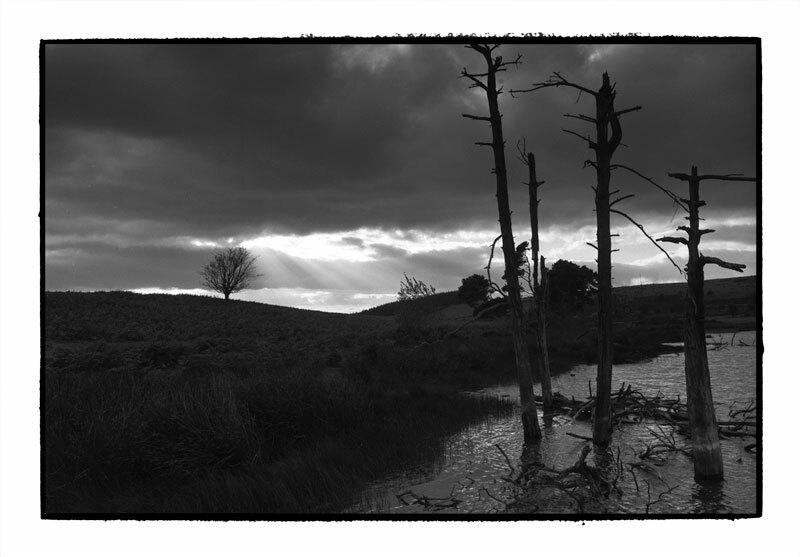 Despite assurances that I was working on a 'Super-Secret-Standalone' book to be published in Spring 2012, it now looks set to be TN7: Dark Reading Matter. This is due to the lack of time available to work on a new book, and properly develop the new characters, settings and tone. At the RAF reserve collection in Stafford, they have a whole host of bizarre items that are currently not on display at either Cosford or Hendon. We were shown around the hangar by the highly committed and encyclopedic curators, and saw not only T E Lawrence's rosary, Douglas Bader's 2nd best leg, but the singed pennant from the back of the R101. 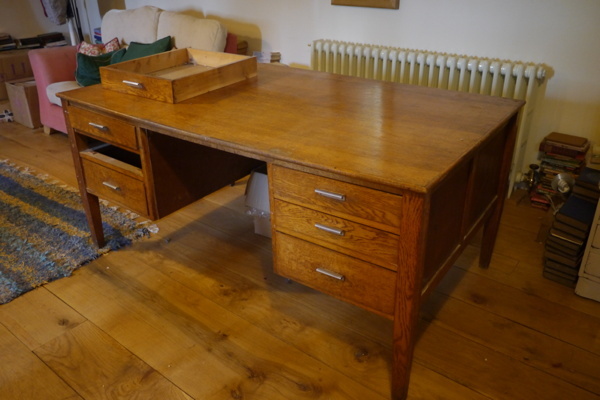 There was furniture, too - Goering's dining room chairs, and this is Sir Arthur 'Bomber' Harris' desk, from which he conducted the aerial bombing campaign against Nazi Germany in the latter part of the war. And there it is, looking worn and chipped, untidly sitting on a pallette. Kind of surreal. Oh, and in case you're interested, Goering's taste in dining room furniture tended towards the grand. 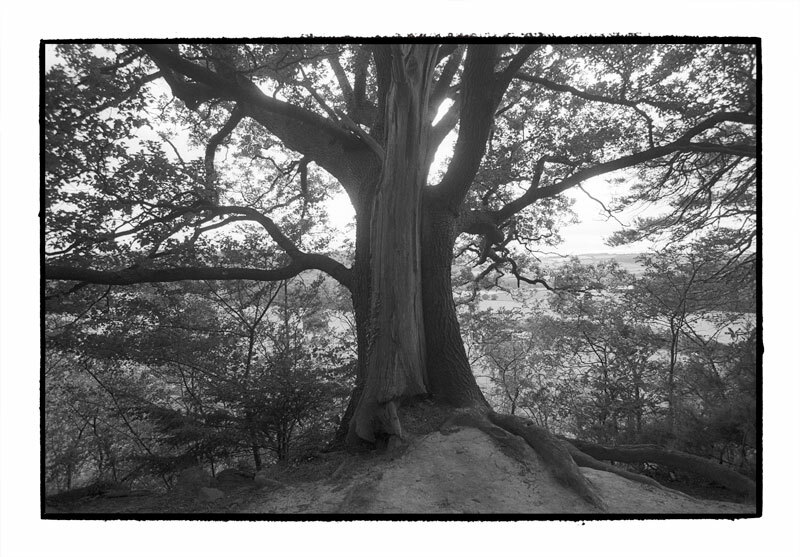 On the Begwyns, Dec 2005. 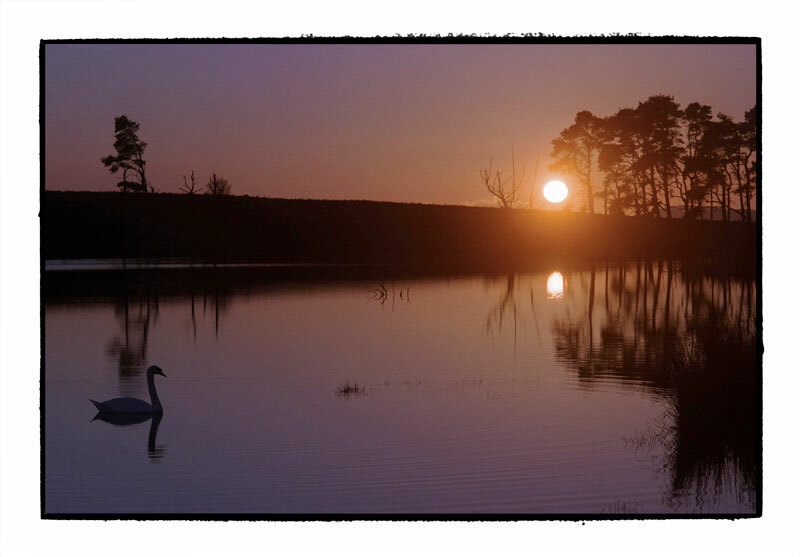 Low sun on an evening trot around the lake on the Begwyns, not far from us. 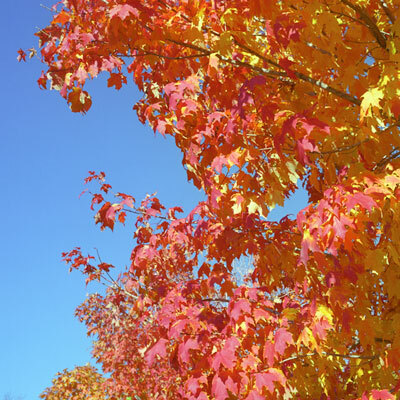 Those dead trees have almost all disappered now, but the sky remains as glowery as ever. Fuji GS645W, with .6ND graduated filter held in place with fingers. Penguin pool, London Zoo, August 2011. The gorgeously realised concrete double-helixed cantilever penguin enclosure designed in the late thirties and wholly unsuited for Penguins. The rather lovely Casson Elephant House is the same - fantastic piece of design that won prizes, plaudits, and fame for Sir Hugh Casson. Absolutely no bloody good for elephants. Both protected buildings. 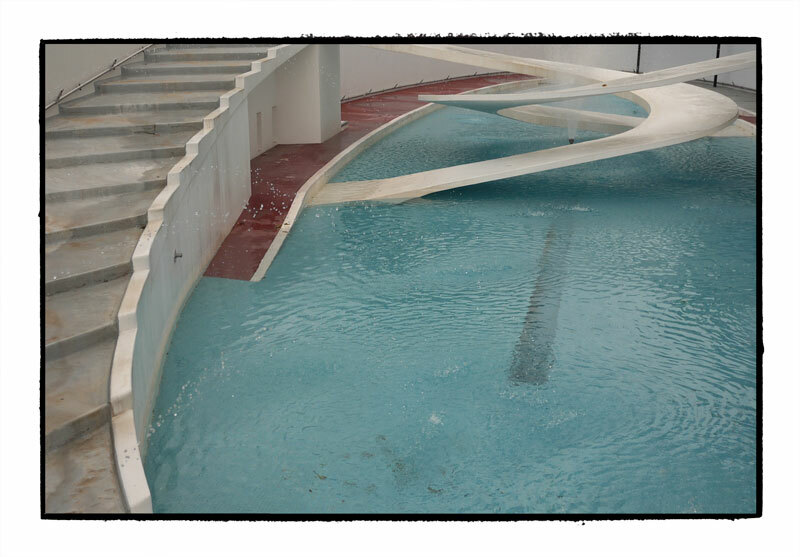 The penguin pool is a fountain feature, the elephant house for smaller animals more suited to it - like wild pig, and humans fond of architectural design. 2nd Oct 2011 Idiot author mistakes Croatian Edition for Czech edition - Still same competition, though. For more details and caption go to Picture of the Week. Published in the Czech Republic and available NOW - Ztracena V dobre Knize, or, if you prefer, Lost in a Good Book. You can order it HERE. 19th Sept 2011 Four grindingly awful rhymes win top prizes! One more book to win! Paperback edition of Last Dragonslayer - out soon! 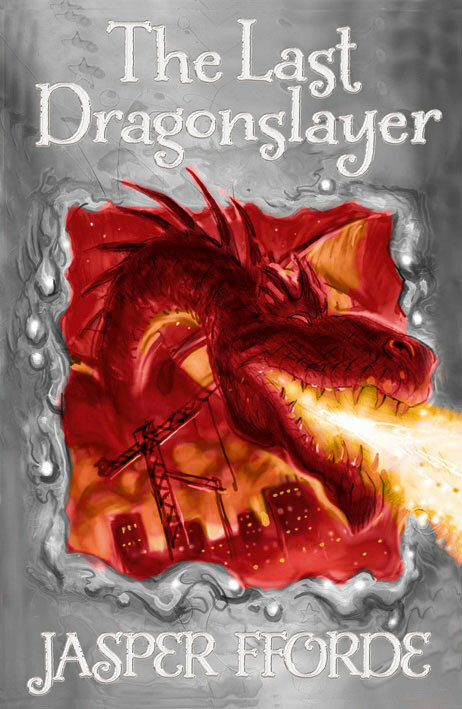 Published on the 15th September 2011, the paperback edition of The Last Dragonslayer. More about this book can be found at My DS-1 mini site and if you want to pre-order, you could try Amazon or Waterstone's. There is a COMPETITION, too, where you can win FREE copies! Go to my competition page or directly to the DS1 'Find a rhyme' competition. 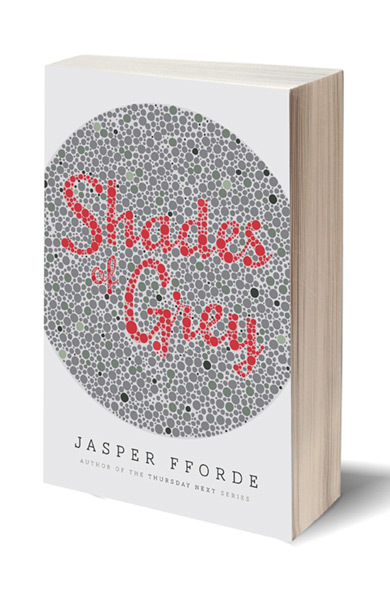 Published September 2011, the German Language edition of Shades of Grey, known as 'Grau. This is published by Eichborn rather than DTV who do my Thursday Books. You can buy this from all good booksellers in Germany, or order it online at Amazon.de. There is a COMPETITION, too, where you can win FREE copies! Go to my competition page or directly to the German Shades of Grey Grau competition. Published in November 2011, The Song of the Quarkbeast. For more details, have a look HERE. If you want to pre-order, try your local bookshop or Amazon or Waterstones. 1st Aug 2011 Upgrade for USA TN6 now available! 1st Aug 2011 Upgrade for UK TN6 now available! If you want to know more this edition, please go to the Mondadori Website. The results to my 'Win a Flipback' competition are in! Please mouse your way to Flipback competition page to see the results.. If you want to know more about Flipbacks which are launched on the 30th June, go to the Flipback Website where, amongst other things, you can download the Launch Brochure. 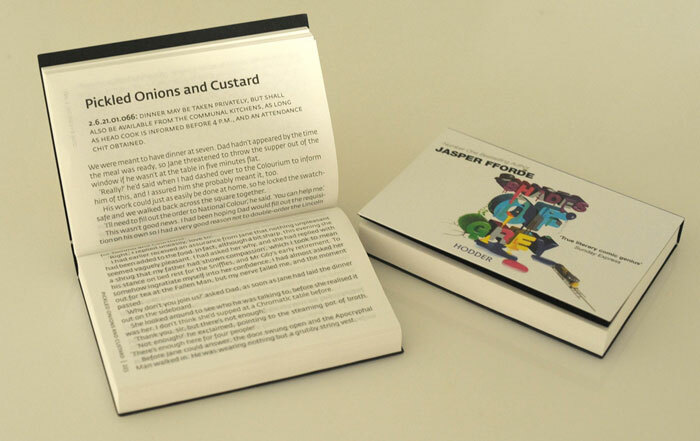 Flipback books are a new publishing idea - compact books (5" by 3") you can really fit into a pocket to take anywhere. They need no batteries, and no WiFi connection - staggering! This is the latest sneak preview of Thomas Allen's amazing work on the TN series rejecket. Art Director is Paul Buckley, comissioning editor, Josh Kendall. We're hoping to see these in the bookstores in the next couple of months.. This afternoon I despatched to my publishers the second novel in the Jennifer Strange series The Song of the Quarkbeast. 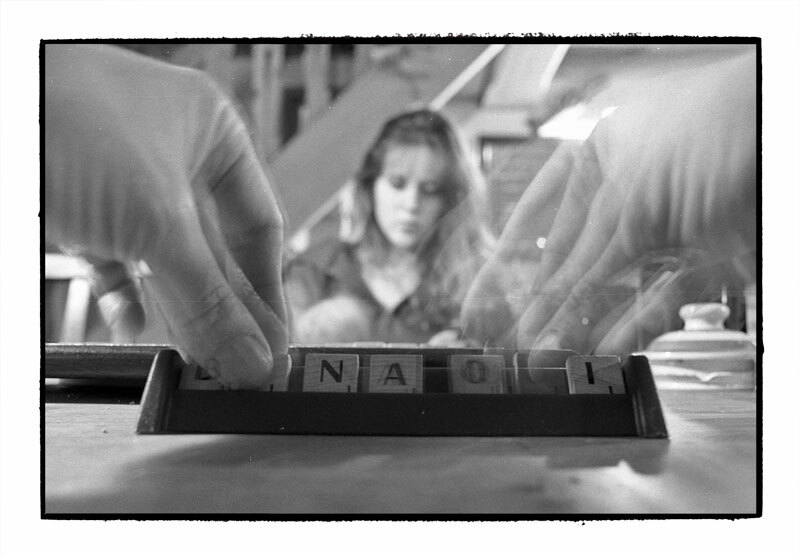 "...You know you're a household word when the Los Angeles Times Crossword has you as a clue. 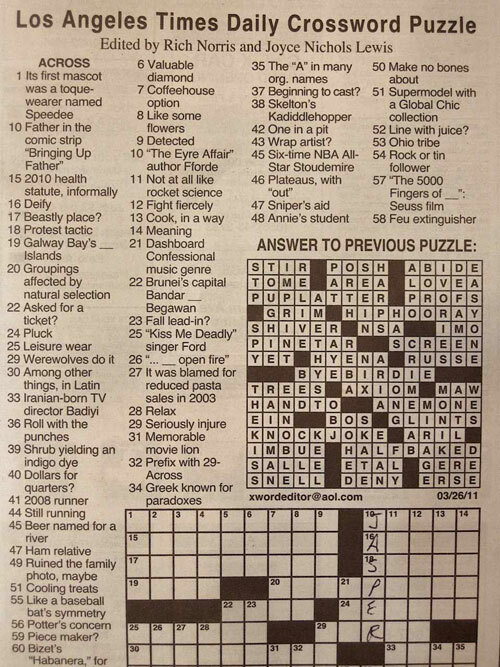 Granted it was only in the Saturday (stumper) puzzle where the clues are more obscure and devious, but I'll keep you posted regarding any crux-verbial retro-temporal placement as an index of rising notoriety/popularity changes..."
It's official. The paperback UK version of TN-5 First Among Sequels will have the hardback artwork and will then match the rest of the series. Not sure when, probably in the next couple of months. This is a sneak preview of the new jacket design for TN1 in the US. Penguin are in the process of rejacketing the series to match the awesome design of One of Our Thursdays is Missing, and this is the proposed artwork for TN1. We like it a great deal - Bold, Clever, Funny. Designer is Tom Allen. Hurry hurry! 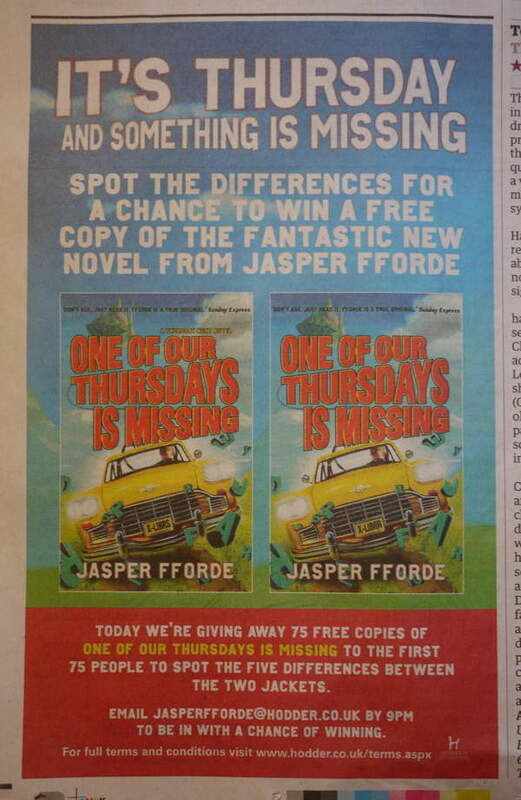 FREE copies of One of Our Thursdays is Missing can be won by doing one of those 'spot the differences' competitions. Today's Guardian, page 40, reviews section. Offer closes 9PM. Now online - a few extras for the imminent launch of TN6, One of Our Thursdays is Missing. There is a TN6 Page that will point you towards the TN6 Sleuthing competition , the usual Special Features (possible spoilers), and for tour details for UK, USA and Canada. There is also an extract from the end of the first chapter to have a look at, and a map of Fiction Island so you can get your bearings. I think there are fw other bits and bobs as well. Have a look. Many thanks to all those who sent in postcard designs for my giveaway postcards this year. The slots are now filled so no more submissions can be considered for the postcards for this year. I thought I'd only do four, but ended up with seven. Becky's design above arrived a tad too late to be included, but I thought definitley worth sharing. Many thanks to all those who sent their ideas in. 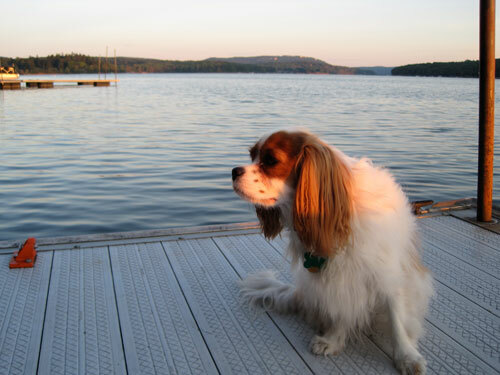 "...I named my Cavalier King Charles Spaniel Tuesday Next, and every time anyone asks me why, I tell them about your Thursday Next books. 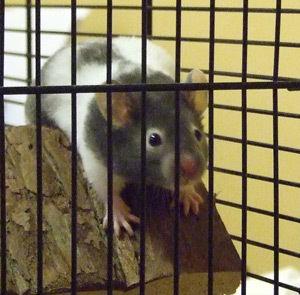 I have attached a picture of her..."
Thursday Next Character Name Inspired Bistro! Yes, it's true! 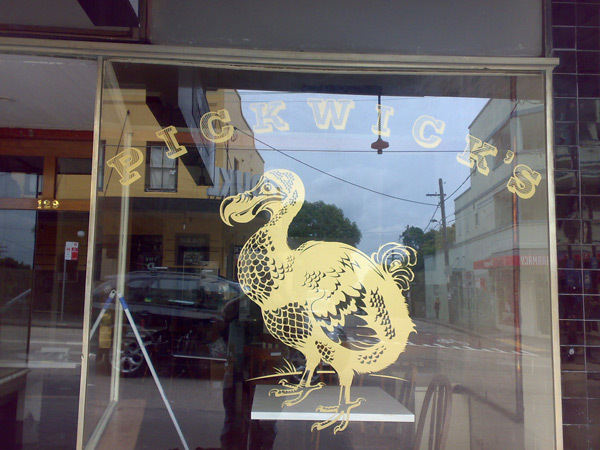 Rumour has reached all the way across the globe and I can confirm that Pickwick's name is indeed Fforde inspired. They are due to open on the 29th January 2011, so if you are in the Enmore area of Sydney, why not drop on by and wish them luck? They do Casual bistro dining for breakfast, lunch and dinner. The The Last Dragonslayer app advert has got a new soundtrack with my RADA-trained voice skills (not). You can watch it HERE and help us get into treble figures on the viewing tally. Note: UK and Commonwealth markets only. It's that time of the decade where the 'we can clone back mammoths' idea comes back, which does sound suspiciously like fund-hungry scientists overegging the pudding for some grant cash. Still, here it is again: Mammoths. My thanks to Megs (and many others) for bringing this to our attention. Matt Roeser reads books and then redesigns the covers. 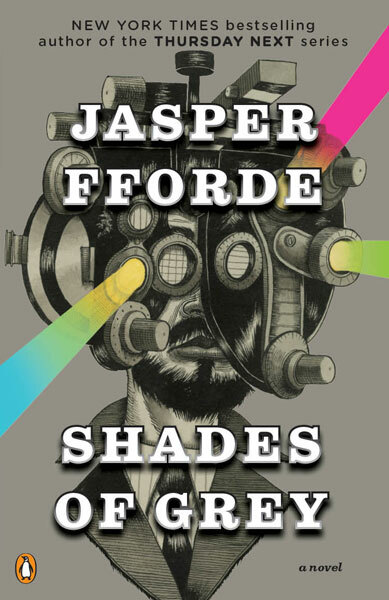 This is his version of Shades of Grey which is extraordinarily close to my own thoughts as to how I thought the cover should look. This isn't the only one he's done. You can see more of Matt's work at his website. His version of A Short History of Time is absolutely brilliant. Max is a reader of my books and also named his hamster after me as he (The hamster, not Max) has 'shades of grey'. This is him. Emilie writes The Writeaholic's Blog and this one is about the first year's writing of an author, to which I have contributed. You can read it here. Daniel Balladier has produced a 2012 Calendar, each month of which is an interview with an author. I think I am 'Mr April'. You can learn more by going to balladier.com. Have you drawn any Ffordian-related artwork? 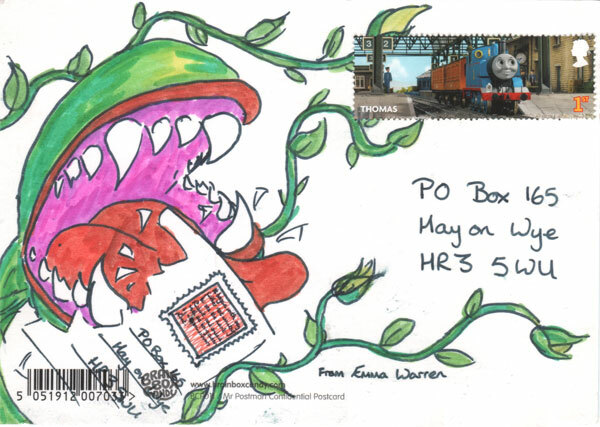 Every year I do a set of postcards for the publication of my books, and this year I thought I would ask fan artists and illustrators to submit something for the official giveaway postcard set. There's no compensation in it aside from a signed book, and I don't need to own the copyright or anything - just your permission to use the illustration on a thousand postcards that will be for free distribution - and on the reverse will be a full credit and a URL so people can be directed to your site. The brief is purposefully vague. Picture, photo, illustration - inspired or based upon anything in any of my books. 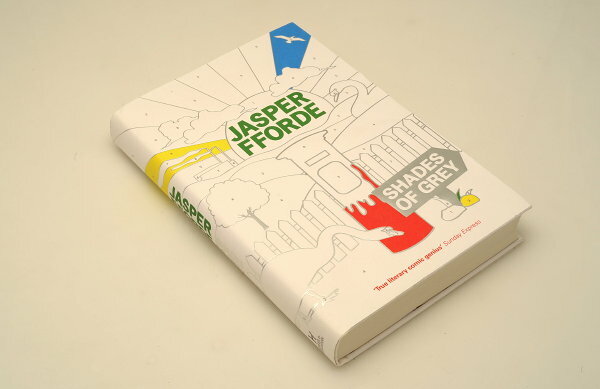 Send any submissions to me at jasper(at)jasperfforde.com and I'll have a look. I have five slots available, and three are already filled, so make your submission sooner rather than later - printer's final date is the 30th Jan.
Brief stopover at end of US tour will see me in Toronto, probably Monday 20th or 21st March, 2011 - maybe for longer. More details when I know them.. Paperback Shades of Grey published! It can be a short poem, a witty aside, a heart-rending plea or a simple threat of personal violence. 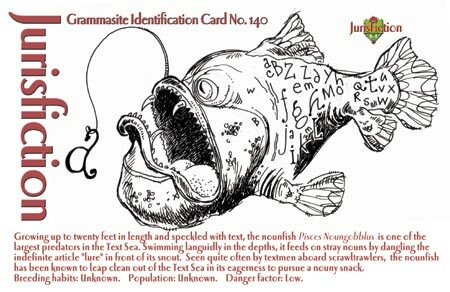 The only rule is that it has to be a Twittery 140 characters in length, and that you allow me to post it up on my website. The most amusing/erudite/bizarre will get the book. 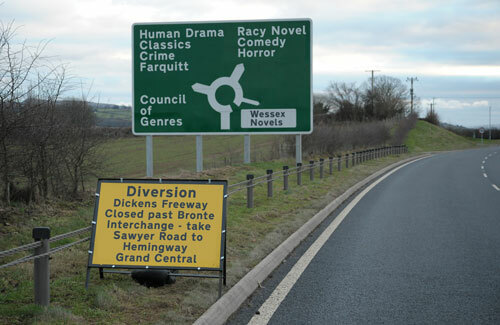 Hodder territories only. Entries to jasper (at) jasperfforde.com with the subject line 'sleuth'. Entries close a week from today, 12th Jan.
COMPETITION results. The answer and winner to the Shades of Grey win-a-Large Print copy can be found on my Competition page, and the results of the competition to win the first signed copy of The Last Dragonslayer can be found right on the LDS Competition Page . There will be another competition for the launch of One of Our Thursdays is missing in Feb/March 2011. Be there, or... don't be there. 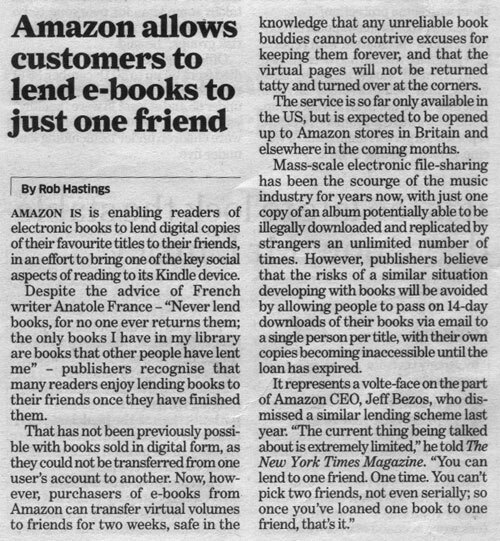 Amazon announces plans to allow Kindle readers to share their books. This is of interest, because many of my readers have expressed concerns that the Kindle prices are too high, and they can't even lend them. A Merry Christmas to all our readers, or seasonal Greetings, if you prefer. 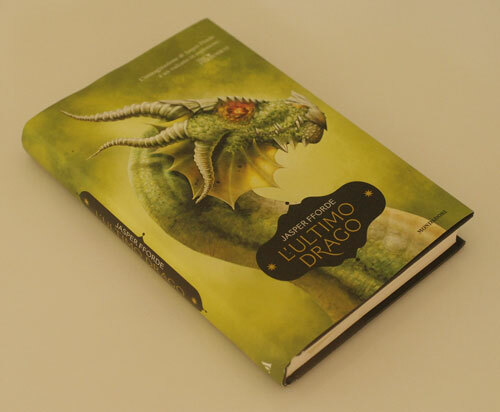 The Last Dragonslayer is currently number two on the SF/Fantasy list at Dymocks, Australia. Just completed the back-of-book adverts for One of Our Thursdays is Missing. These are a staple of the TN and NC series, and are actually rather fun. I like to include a puff for the Wales Tourist Industry, as Wales is an excellent place to live and visit. The Gower Peninsula is particulalry lovely, and if anyone is thinking about hols in the UK next year, you could do a lot worse than arrange a visit. 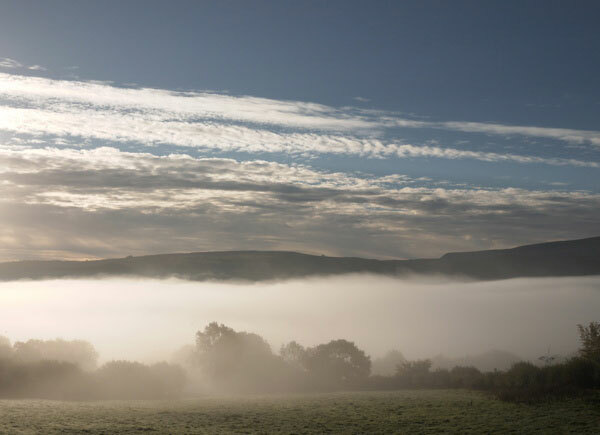 Don't be put off by the 'Not Always Raining' byline - it's lovely, even in the rain. We got a great broadsheet review in the Independent today, Monday. Hoorah for Christina Hardyment! NEW PAGE: More people seem to want to download eBooks these days, and I have been getting a lot of emails from people wanting to know where to find them all. We have written a new page which attempts to condense all these links in one place. We're still working on it, and as you might imagine, different territories require different links. Anyway, you can find the new eBook page HERE or follow the link above. A week after being released, The Last Dragonslayer App has clawed its way into the top twenty book app list. YOU can make it climb higher! Go to the App Store and download it. Five star review from six reviews - and none of them from family members! 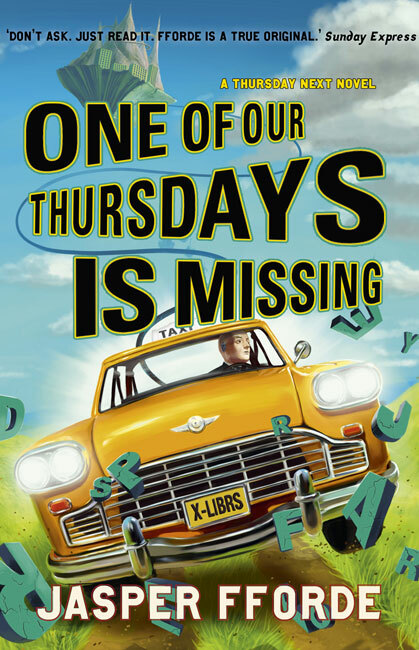 First look at UK cover design for One of our Thursdays is Missing. This is the 'final approval' before artwork is finalised, and features a similar style to the rest of the series. Illustrator is once again Mark Thomas. Stop those emails right now! The Last Dragonslayer will be available in North America. As of last week, I've agreed a deal with publishers Houghton Mifflin Harcourt to distribute TLDS in the States. Naturally all of us here at Fforde Towers are delighted with the arrangement. 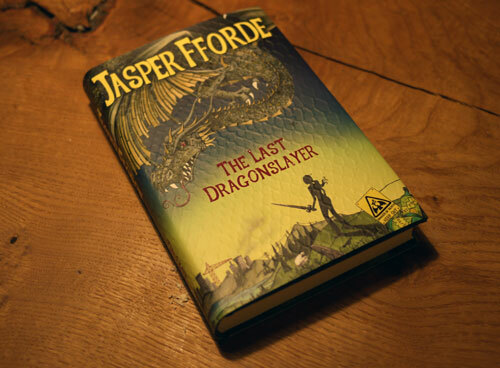 "...Harcourt Children's Books, an imprint of the Houghton Mifflin Harcourt Children's Book Group, has acquired U.S. rights to The Last Dragonslayer and two other titles in a new middle-grade fantasy series by Jasper Fforde. Fforde is best known for The Eyre Affair and other books in his ongoing series of clever mystery novels starring crime-fighter Thursday Next. 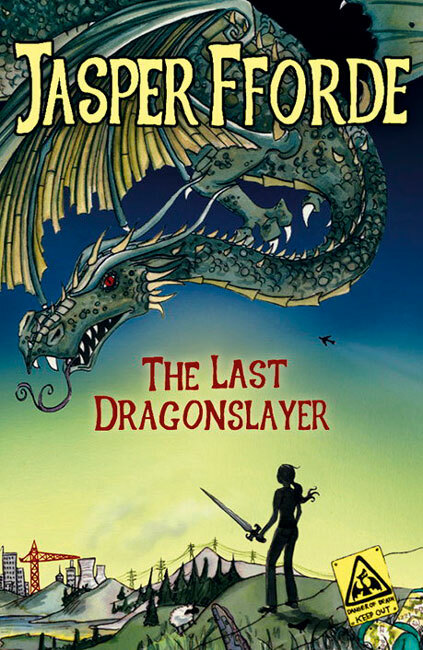 In The Last Dragonslayer, Fforde's first foray into children's books, fifteen-year-old Jennifer Strange runs Kazam!, an employment agency that finds work for soothsayers and sorcerers. But magical work is drying up and even magic carpets are reduced to delivering pizza. So when signs start to predict the death of the world's last dragon by an unknown dragonslayer, it falls to Jennifer to take up the sword. 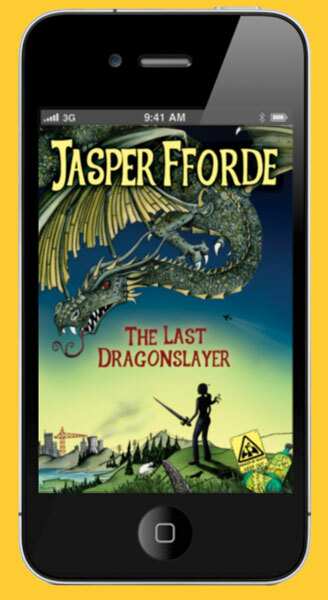 Full of surprises, The Last Dragonslayer is classic storytelling blended with Fforde's crackling contemporary wit..."
But I said North America, didn't I? And geographically speaking this also includes Canada, so we are delighted to also announce that HarperCollins will have exclusive publication rights in Canada. More publication dates and details as I know them. Fun time. 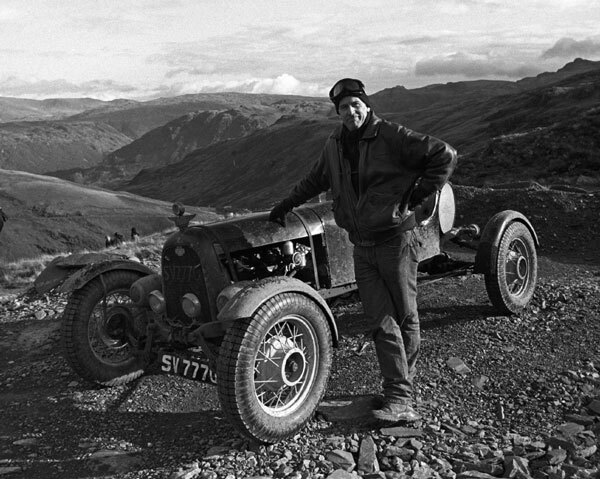 Fforde J poses with Ford T about two-thirds of the way up 'Drumhouse', one of the major hills to be negotiated at the 2010 Lakeland trial in Cumbria. It's playing silly buggers in vintage cars, to be honest. 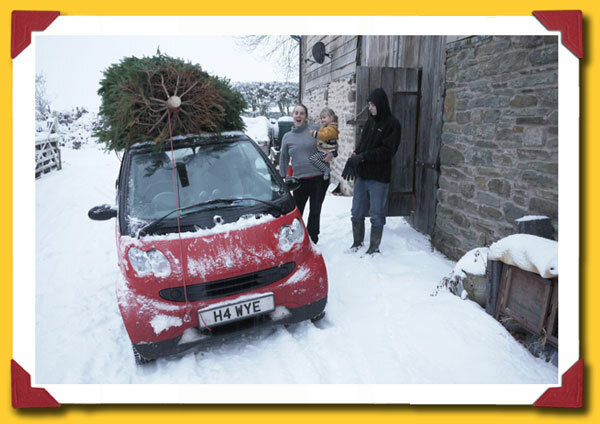 Points are awarded to how far you can negotiate around places that 4X4s might not dare. 'Drumhouse' climbs up 1500' and goes past five hairpin turns on loose slate in the space of half a mile - almost vertically up. There were ten hills to negotiate and we came 55 out of 61 - a personal best. I said it was fun - I didn't say I was any good at it..
to get to the app store, OR if you want to watch a Utube video of what the app can do, click HERE. Note: UK and Commonwealth markets only. Available from November 2011 (UK). There will also be an 'DragonApp' for iPad/iPhone available at the same time. For more details, go to my Dragonslayer page. New DTV German-language covers. Available soon in Germany, Austria and Switzerland. We think they are fab - possibly best yet! The UK paperback edition of 'Shades of Grey'. Available in at all good booksellers and several bad ones. 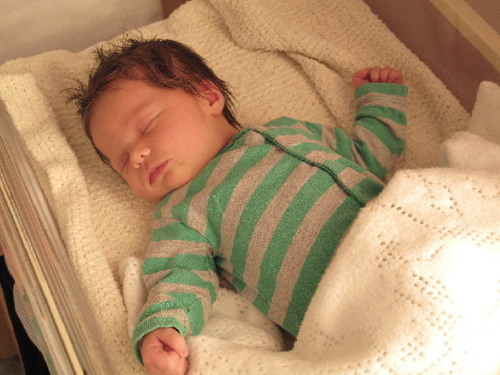 Born at home on the 27th July, 2010, a bouncing 7lbs 8oz girl, Stella Morel Fforde. Mum and baby all well. The incredible thatch of black hair has astounded and amazed vistors, and I have already lost three combs. (They will probably turn up glacier fashion, sometime around her ninth birthday). Our grateful thanks to Powys midwifery and the staff at Hereford County Hospital whose close attention and support was exemplary, and to Beveridge, Bevan and Atlee for creating the National Health Service. It's a national treasure. The 2010 Fforde Ffiesta went off exceptionally well. 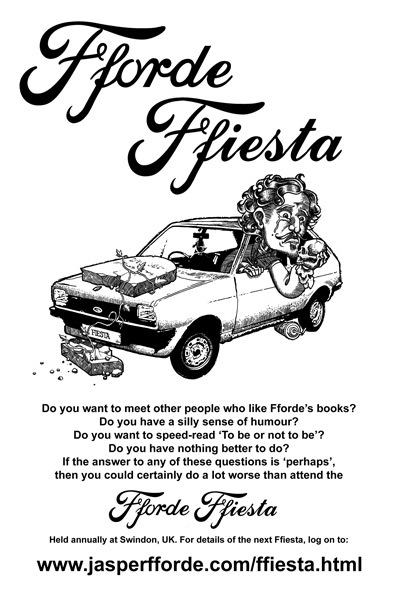 To see some text and pictures, go to my 2010 Fforde Ffiesta page. Fforde's first children's book to be published in the UK, November 2011. For more details, go to my Dragonslayer page. 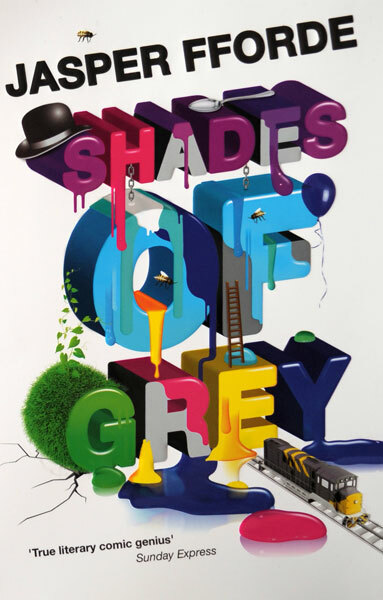 Potential cover of Paperback Shades of Grey - coming to UK Bookshops in February 2011. All the same words, only cheaper. Portuguese version of The Eyre Affair which has just been published. I think the cover very natty, although I'm not sure whether Thursday is a hat sort of person. The winner of Thursday Nextreme for 2009 has now been announced. Go to the 2009 Nextreme Page for more details.. Some of you have expressed fear and surprise that the UK Thursday Next paperbacks are not available with the Mark Thomas 'Austen Rover' type cover that was on the hardback. This can be remedied in the comfort of your own home. Go to my How to fix your TN5 Paperback page for more details.. 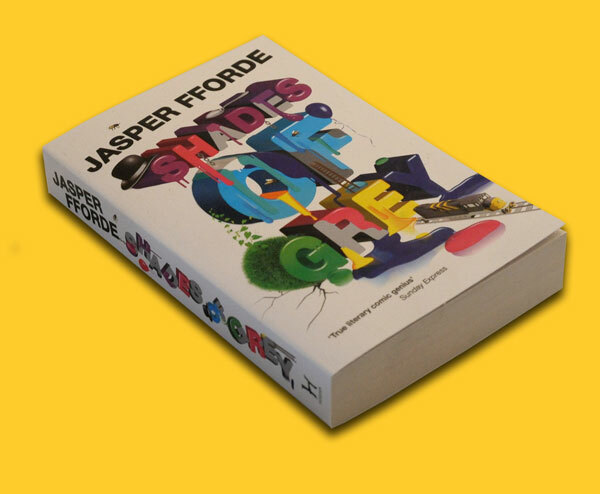 In a move that may be unique, Fforde now offers a signed eBook service for the US readers of Shades of Grey. All you need to is download a PDF of asigned frontispiece and upload it to your eReader. So simple. Go to my Shades of Grey mini-site for more details.. Arrived today. 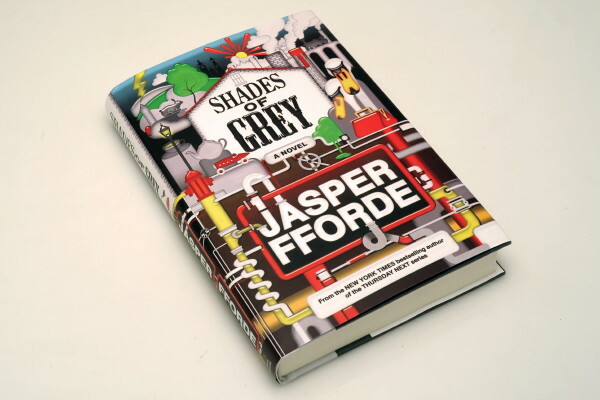 The UK Hardback copy of Shades of Grey. This and its companion US edition will carry a 'First Signed' stamp and be available as a glittering free gift for some gimcrack competitions we're dreaming up. Stay tuned. Shades of Grey preview website. Arrived today. The USA Hardback copy of Shades of Grey. This and its companion UK edition will carry a 'First Signed' stamp and be available as a glittering free gift for some gimcrack competitions we're dreaming up. Stay tuned. Shades of Grey preview website. Michael Porritt sent this in from Canada as he thought it Nextian. 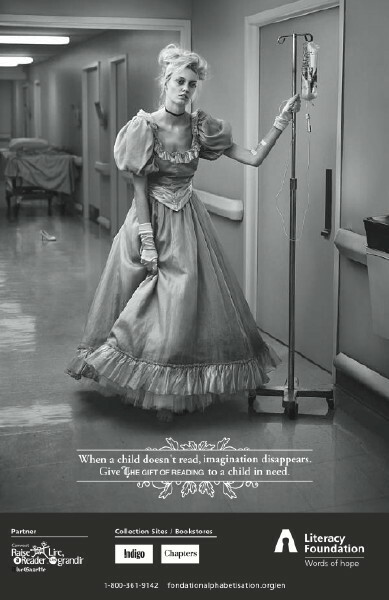 It's actually an advert for the Canadian Literacy Foundation and it was so good we thought we'd share. Poor Cinders - but you will make it to the ball! 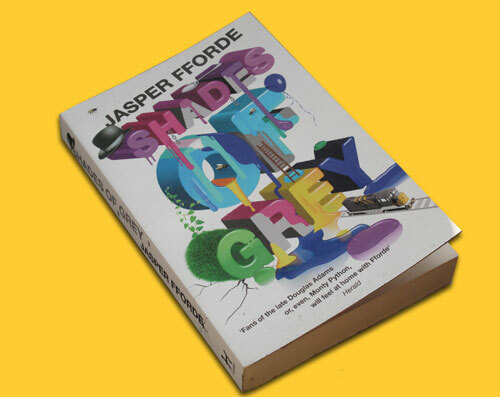 UK Markets ONLY: Hodder are giving away free two-chapter Samplers of Shades of Grey. To learn how, either go to my Shades of Grey Preview site or jump to the Hodder website direct. Please note: This offer is only open to UK and Commonwealth readers. 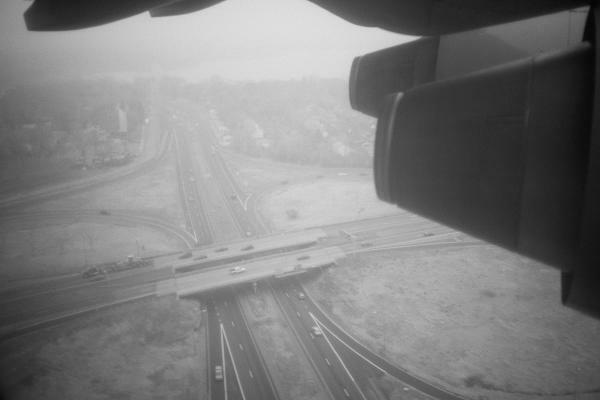 A foggy day on tour..
German language TN5 now published! To win the first signed copy, go to my unimaginatively titled 'Win the first signed copy' page. Preview site for 'Shades of Grey' now online. Go to SoG Preview or click on the top banner. 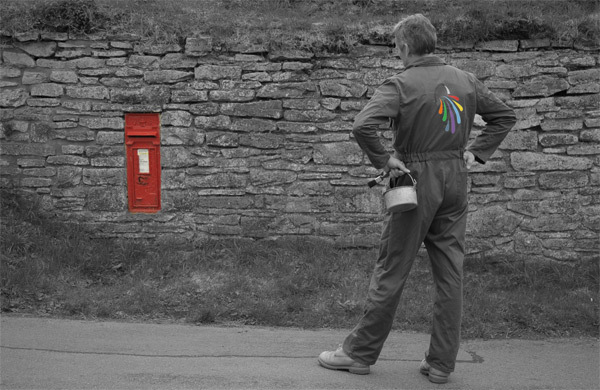 A National Colour Operative admires his work..
Tickets are now on sale for the FFORDE FFIESTA. 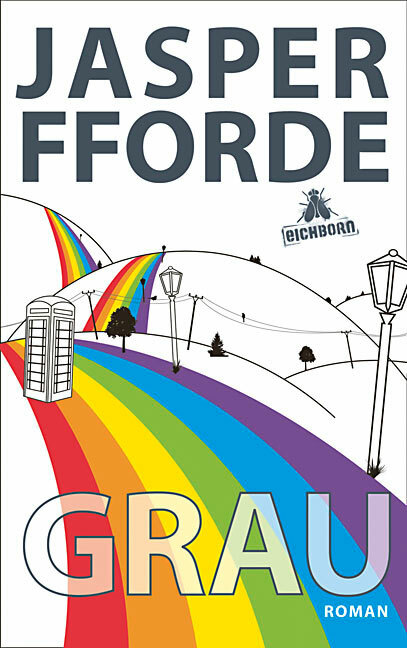 Go to the Fforde Ffiesta website to buy yours now! Apologies all round as I have had to cancel the Australian tour that was going to happen next Feb/March. I have a mid-May deadline next year, and losing another four weeks soon after January which is touring for Shades of Grey, I am concerned there won't be enough time, and I'd rather cancell now than later. Apologies again. Sarm Falaki has been appointed the GSD Arch-Representative of Swindon and Northern Wiltshire. They hold the title 'Your multiness' and have the power to form meetings and hold services. More details to follow. Maybe. Jasper has contributed a pep talk to the 'National Novel Writing Month' (NaNoWriMo) which is an excellent way to get started. It doesn't matter what you write - just write! More details can be found at the NaNoWriMo website. USA tour dates and venues January 2010 announced. Rough schedule on the Appearances page. Jasper has just contributed to the Thousand Words For Love book project, a multi-author idea to have as many of us scribblers as possible contribute to a book. This is in aid of the Helen and Douglas House Hospice, and although without a publisher at present, one will be sought when the book nears completion. My section is the fourth in, and is all about negotiating for a car and driver. Well, it's all finished and off at the Copyeditors. After a nail-biting run down to the tape, Shades of Grey 1: The Road to High Saffron is finally finished, just six months behind schedule - sorry for that. I hadn't realised that creating a whole new world would take so much work, but looking at back at the Thursday and NCD worlds, they were both the product of two to three years of continuous exploration and improvement before the books felt 'right'. In that respect, Grey was perhaps a bit quicker. Suffice to say, while First Among Sequels took 114 days over five months to write, Grey took 433 days over eighteen months. I hope it was worth the wait. But you do get a bit more for your money - it's 139,000 words long, as opposed to the usual 100,000. The auction ends on the 3rd May 2009. Shades of Grey publication delayed until December 2009. Yes, sorry about this folks, but my 150,000 word tome is not quite there yet. Almost, but not quite. The US aim to publish on the 28th December 2009, and for the UK to follow suit in January 2010. Tours in both territories. 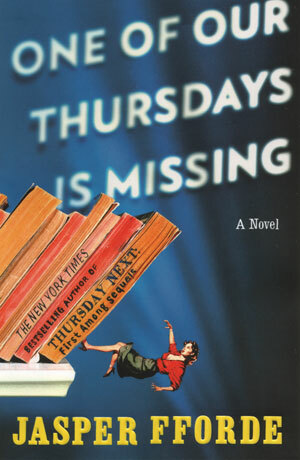 By that time One of our Thursdays is Missing will be an advanced state, but we don't have a publication date for that yet, but will hope for August 2010. The indexing method has changed on my books again, and as you will see above, has many sub-indexes leading to lists of pages available. We may see some more changes in the next few weeks as I give the site a bit of a makeover. Just recently the Edinburgh UNESCO City of Literature staff have announced a project called The Lost World Read which is all about encouraging people to read Conan Doyle's seminal dino-discovering tome, The Lost World. As part of this campaign, there are many tie-ins, free book distribution, online fun, events and what-have-you. Part of this celebration is a project called the The Lost Book , which is an animated story, and as part of this, the public are invited to collaboratively write a sequel to The Lost World, chapter by chapter. 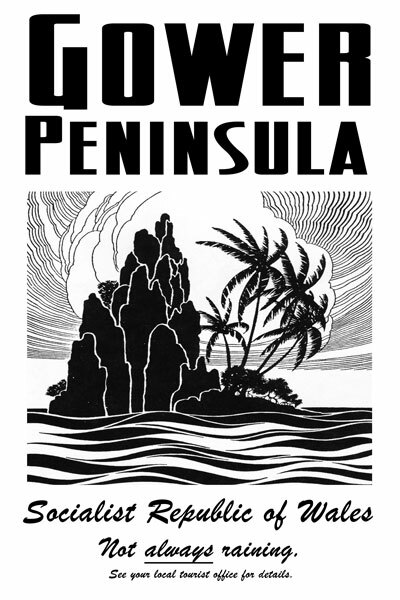 Fforde has penned the set-up to this 'lost' book, so why not have a look to see if you would like to contribute? The 'What's New? page of jasper's website recently fell into a closed loop 'What's New' updating procedure whereby it constantly updated itself about the fact that it had been updated, then reported that updating. Thankfully, after bringing most of Europe's servers to a standstill with eight trillion updates, it has finally been rectified. Three updates have been left for historical reasons. The Big Over Easy (B Format paperback, first printing) 39,500 copies in circulation. The Eyre Affair (UK paperback, 31st edition) 3000 copies, 167,550 in circulation. Lost in a Good Book (UK paperback, 17th edition) 3000 copies, 103,150 in circulation. The Big Over Easy (Export paperback) 2000 copies, 14,000 in circulation. Lost in a Good Book (Export paperback) 3000 copies, 17,000 in circulation. +++ Fforde News Fflash Latest Reprint Bulletin: The Eyre Affair (Export Edition) is now on its 5th edition, with an extra 2000 copies meaning 13,500 of this edition in circulation. +++ Fforde News Fflash: The Big Over Easy appears in paperback. Not for general consumption in the UK where it is released in June, but for the export market. Cover is the same image as the hardback but slightly rejigged for the smaller cover. There were 11,000 copies of the diddy 'A' Format printed and the ISBN is: 0-340-8356-9. +++ Fforde News Fflash:The 2007 VCE (Victoria, Australia) Literature panels have chosen this title once again to be on the VCE Literature Text list for 2007.It is also on for 2006. 2007 will see this title being on the list for the third year in a row. Which basically means that it is available as an 'approved' title for teaching in Victoria - hoorah! +++ Fforde News Fflash:Latest reprint bulletin:Lost in a Good Book enters its 16th reprint in the UK. An extra 3000 copies which means we have 100,150 in print. The Well of Lost Plots enters its 7th print run with an extra 2500 copies so 78,100 copies in print. The Eyre Affair is now on its 30th edition, with an extra 4000 copies meaning 164,550 copies in print. Hoorah! +++ Fforde News Fflash: Come the new year there will be another Fforde charity auction of bits and bobs related to me and my books. Lists of lots will be published ahead of time, although this year we will have several identical lots, so more people have a chance of winning stuff. There will be at least twenty copies of the TN1 1st edtion with upper case signature - part of a consignment I signed in 2001 and have remained at Hodder. There are also quite a few proofs of TN4 and TN2 up for grabs - plus other stuff. Stay tuned! +++ Fforde News Fflash: COMING SOON: Paperback copies of my books (US and UK) are to be available from my website, with an option to have it dedicated how you want. A freebie postcard will be included with each book as well as a moniker. Price will be RRP, plus postage. Hardbacks of any description or unusual collector's items will not be available. +++ Fforde News Fflash:The jolly bunch from the 'Storyman' thing turned up to record me for one of their wednesday evening slots in a new series to be broadcast on Radio4 next year. Andrew Clover was the interviwer and a rollicking time was had by all. More details to follow. +++ Fforde News Fflash: The Hodder 'A Format' export edition of Something Rotten has just entered its third printing of 2000 copies, which mean there are 14,000 copies of this particular edition in print. 'Export Edition' means Canada, New Zealand, Australia, SA, export markets and international airport bookshops. +++ Fforde News Fflash: The boxed set of the first four Thursday Next books has just been printed - 5000 initial sets. I have one and it seems to be on sale at Amazon, without picture. This is something I have often thought about in jest - I imagine Thursday will be quite chuffed, although knowing her, she won't show it. +++ Fforde News Fflash: The Goliath Corporation, in its magnanimous benovelence, have generously allowed the public to buy even more quality products from their clothing outlets. Two more designs from the trough of merchandising: A much overdue Specops-17 and a Toast T-shirt. For more details, please click HERE. +++ Fforde News Fflash:The Goliath Corporation, as part of a long term commitment to ensure that everyone wears their clothes, have had to reluctantly reduce prices. You can take advantage of this enforced level of generosity by taking a look at the new pricing structure. (It's pretty simple: all T-shirts down from £15 to £10; mugs and hats stay the same.) For more details, please click HERE. 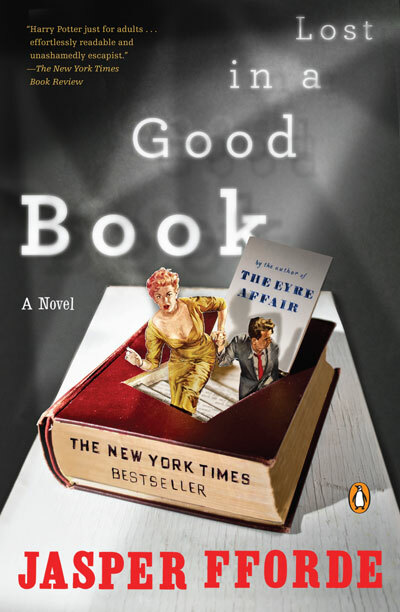 +++ Fforde News Fflash:Latest reprint bulletin:Lost in a Good Book enters its 15th reprint in the UK, with 97,150 copies in print, Something Rotten enters its 5th print run with 48,500 copies in print. 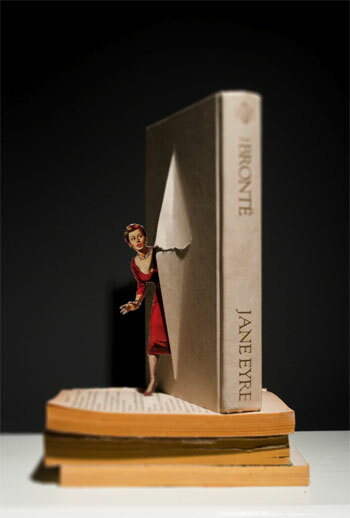 The Eyre Affair is now on its 28th edition, with 155,550 copies in print. Hoorah! +++ Fforde News Fflash:Lost in a Good Book enters its 14th reprint in the UK, with 92,150 copies in print. Hoorah! +++ Fforde News Fflash:DTV, the German publishers, have concluded negotiations with Fforde and the German language edition of Something Rotten will be published by them next year. 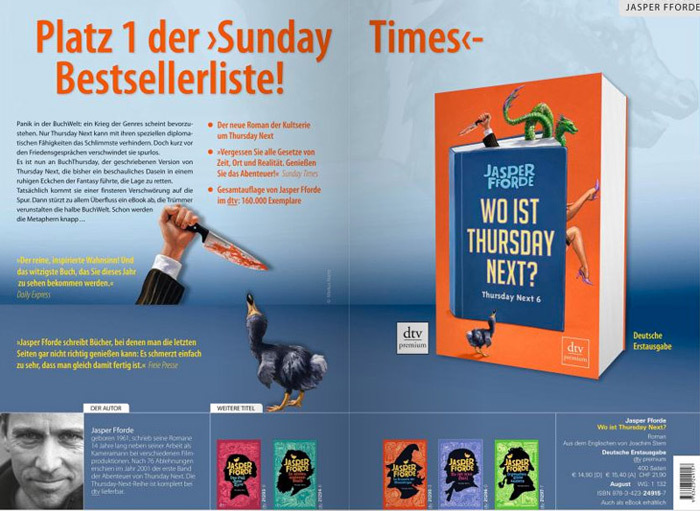 Notice to collector's of the German books: The trade Paperback is now released for TNs 1&2. The only difference aside from the copyright page is the the word 'Galleria' instead of 'DTV' on the spine. +++ Fforde News Fflash:Italians to read The Eyre Affair and Lost in a Good Book in their native tongue. Marcos Y Marcos, the noted quality publisher has bought the rights for the first two books in the Thursday Next series. MYM is a hardback publisher, so hardback it is, with the paperbacks appearing the year after, but from a different imprint. "...Well, they are in the pipeline at present and will be purchasable from my website as soon as we get all the designs sorted out. Initially this will be as four one-colour designs (SpecOps-27, Goliath Corporation and two others as yet undecided). Price is as yet unknown but will, I hope, allow us to recoup some the costs of the giveaway postcards and the hosting of the websites. We are also proposing a certain amount of each sale to go towards the Usk House Day Hospice. So they're not going to be super-bargains, but won't be me plunging my snout deep into the avaricious trough of merchandising, either..."